They may be another year older, but memories of World War II remain fresh in the minds of those who experienced the war. Alexander (Sasha) Ulyanov went to the front during the Second World War when he was 11 years old. Actually, he didn’t so much go to the front as the front came to him. The wooden houses in the Minsk neighborhood where Ulyanov lived with his grandmother burned down in the very first hours of the German air raids in 1941. While his grandmother stayed in the city working as a hospital nurse, the boy escaped to the woods to join the partisans. Today, 70 years later, Alexander Ulyanov has no need to flee the fascists or give shelter to civilians, but for some reason he is quite fidgety. He lives in a typical Moscow suburb, in a drab nine-story apartment block. This Victory Day, Uncle Sasha, as he is known to his neighbors, is going to a local school to speak to students about the war. It has become something of a tradition for schools to invite veterans of World War II to speak to students on the eve of May 9. The schools treat them to food and drinks and stage a talent show. The veterans’ council in the neighborhood where Uncle Sasha lives has 20 members. Almost all of them saw action during the war, one of them is a Hero of the Soviet Union, others are veterans who worked for the war effort in the rear making ammunition, baking bread. Sasha hurries to the meeting point, a bus station, a couple of kilometers away from his home. 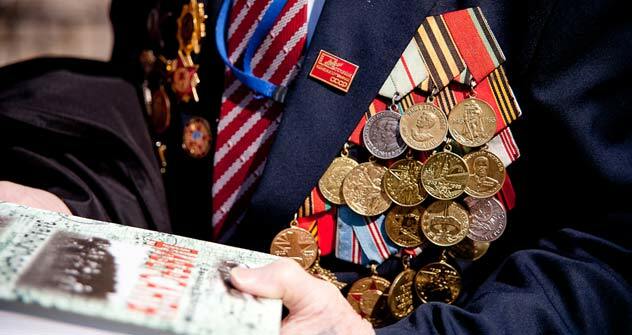 He seems to be oblivious to his age and of the fact that his jacket is heavy with medals. He spots another veteran weaving his way through the traffic in the middle of the road. Uncle Sasha smiles as he salutes his elder comrade. “Would you like to sit down?” the bus station guard offers them chairs. “We are still young. An age like 88 isn’t that old,” the older veteran replies. The school’s minibus arrives and veterans converge from all sides. In the schoolyard, the veterans are greeted by a line of fifth graders. The teachers invite everyone all the way up to the third floor. Along the way, one of the veterans recounts a recent experience: “I was approached on the street by about five Armenian boys. They looked at my medals and stars. And what is more, they had the right words to congratulate me. I appreciate that. Schoolchildren are also good to us, though it happens only twice a year, on Feb. 23 (formerly known as Red Army Day and now called Defender of the Fatherland Day) and May 9. The twenty minutes of conversation time run out and an excited teacher invites everyone to attend the holiday concert. There was a hero of the Soviet Union in her family. He earned the award at the age of 20 fighting for his native Dagestan. That is why the veterans’ words struck a special chord with her. “During the war they never asked who was Tajik and who was Uzbek, all the dead were buried in a common grave. Now these people are made into terrorists. Dagestan is a forsaken place, people with real education flee from there. Give people jobs; give them an idea to work for. The peoples of our country must be unified,” the teacher said. During the concert, a boy in an expensive suit reads something “about the war” from his notes with a heavy lisp. The veterans sitting in the front row are listening attentively. Routines follow one after another and even when there is a problem of some sort – the music stops or the microphone goes dead – the veterans do not mind. They do not mind singing some old war songs themselves. The show merges seamlessly into a party; the veterans are seated at large tables and are left alone. Like in wartime, they get their regular shot of vodka. All of a sudden a group of girls starts singing the famous song “Victory Day” and all the veterans join in.